“QR MOVE.” Lux Boreal Dance Company. LA JOLLA, CA — Patricia Rincon Dance Collective, renowned for its adventourous programing, celebrates its 32-year anniversary this year with a new experimental installation of “Blurred Borders Dance Festival” (#16) at the UCSD Molly and Arthur Wagner Dance Building, Studio Theatre (Behind La Jolla Playhouse, on the UCSD campus) on May 22, and 23, 2015 at 8:00 p.m. The two-evening performances mark what many San Diego audiences have come to regard as one of the premiere risk-taking annual San Diego dance events. The Blurred Borders Festival is an annual cross-cultural event created to foster the artistic and intellectual exchange of ideas of progressive international, national and local artists. Over the years this event has brought to San Diego stages exciting companies from Singapore, Switzerland, Amsterdam, Argentina, Ireland, Mexico, San Francisco and Los Angeles, in addition to many well-respected local and national dance theater artists. This year’s Blurred Borders event will feature new works by Baja California’s premeiere dance company Lux Boreal, Florida/San Diego artist Erin Tracy and Patricia Rincon Dance Collective’s Natalia Valerdi. Each artist is crossing boundaries in their work and blurring the lines between art forms with quality and daring inventivness. A cultural landscape of fresh, top-notch multi-media dance-theatre, including three San Diego premieres. WHEN: May 22 and 23, 2015 at 8:00 p.m.
At the door: $22 General; $15 Students/Seniors (65+); UCSD Students $10. “QR MOVE” places us in the surface of immediate worlds, similar to what happens in our daily reality, finding the easy way to get into different universes systematically constructed by technology. We are tagged with fixed codes that mark our sense of belonging, as we become standard. We remain tied to moving bars waiting to be deciphered; eagerly seeking the release thread that leads us to discover that we are part of the even larger chaos. 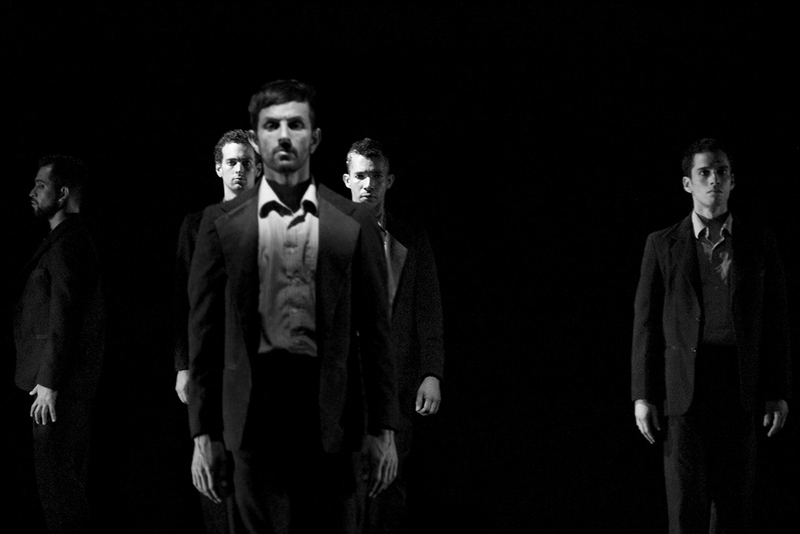 Choreography by Ángel Arámbula and Octavio Dagnino. Performed by Raùl Navarro, Matthew Armstrong, Angel Arámbula, Henry Torres, Octavio Dagnino and Briseida López. With original sound score by Octavio Dagnino and light design by Henry Torres. Founded in 2002, Lux Boreal Dance Company is a circle of choreographers and dancers from all over Mexico, converging through dance towards a common language to express their vision of reality through Art. It relies on 11 full-time members, collaborators and guest artists. Lux Boreal is part of a bi-national artistic movement, which takes place in the Tijuana (Mex) – San Diego (USA) border region, reinforcing the bonds between artistic communities and diverse audiences. Lux Boreal has been featured in major dance festivals and venues throughout Mexico, and has performed internationally including in the United States, Chile, Venezuela, Nicaragua, Bolivia, Spain, Latvia, Brazil, Argentina, France, Germany and Ireland. Lux Boreal values international exchange experiences and collaborations with guest artists. The core of the company has been nurtured by international choreographers such as Allyson Green (USA), Claudia Lavista (Mexico), Leslie Seiters (USA), Magdalena Brezzo (Mexico-Uruguay) and Phillip Adams (Australia). Lux Boreal was selected by Dance Magazine’s “25 to WATCH” in 2009. Since 2008 the company has been listed on the Walk of Fame in Tijuana, Mexico. Lux Boreal received the Audience Choice Award in the International Dance Festival Lila Lopez in San Luis Potosi, Mexico. Since 2007, the company has received annual sponsorship from the Mexican National Council for Arts and Culture due to its remarkable presence in the national arts scene in Mexico. “Mara’s Daughters” presents a meditation on the forces that pull away from the spiritual life. In Buddhism, Mara’s daughters tried to distract Gautama Buddha while he was meditating under the Bodhi tree by tempting him. In some texts, they represent craving, boredom, and passion. How do we confront our own versions of Mara? What is the difference between sitting in boredom and sitting in meditation when nobody knows but us? How do we transform the image of woman as temptress into an image of woman as empowered and enlightened being? These questions drive this contemporary dance and film. Performed by Sarah Navarrete and Bonnie Lee. Featuring the short film mara, Directed by Natalia Valerdi, with assistance from filmmaker Roosevelt Ulloa. “Mara’s Daughters” is inspired by the photography of Brian Harris and by the Tibetan Nuns Project, which provides education and humanitarian aid to refugee nuns from Tibet and India. Natalia Valerdi, Associate Director of the Patricia Rincon Dance Collective (PRDC), is a choreographer and new media artist born in Mexico City. She has performed, taught and choreographed in Cuba, Europe, Mexico and California. Her recent choreographic works include Arts in Action: Connected, which explored social media mapping through choreography, Disintegration, Traces of Water and White Dreams. For the last two seasons, Ms. Valerdi has co-produced PRDC’s Salon Dances series at the Encinitas Library where she premiered her choreography “Caught.” She recently completed a tour with PRDC to the international TANZINOLTEN Dance Festival in Switzerland and Europe in November 2013. Her video projection design collaborations with Patricia Rincon include BODYPARTS, Protest, Peeled and The Myth Project: Altar. She co-produced the documentary dance film LATINO NOW: Landscape of Desire with Patricia Rincon, a film about the American Dream and the immigration debate, ­filmed in Mexico, Argentina and California, and which had its premiere screening at the UCSD Art Gallery’s Fronteras Series, “Re-Remembering Fronteras,” in March 2011, with a rescreening at San Diego Repertory Theatre’s Tortilla Curtain in 2012, and in Buenos Aires, Argentina in 2011. Ms. Valerdi has also collaborated as projection designer with UK choreographer Yolande Snaith’s One Hundred Feet, which has been performed with acclaim on numerous stages, and with choreographer Alicia Rincon on various projects including Working Class and Rites of Passage. She has also performed with Jean Isaacs, Allyson Green, Yolande Snaith, Loretta Livingston (Los Angeles) and Ricardo Peralta (Mexico). Ms. Valerdi received her M.F.A. in Dance and Technology from the University of California, Irvine. She is currently a lecturer at the University of California, San Diego, and works with inner-city youth through the arts integration organization Collaborations: Teachers and Artists. This is her 10th year with PRDC. “Better Metaphors” Better Metaphors uses movement and monologue to explore unconscious gender bias, sexiness, and graham crackers. Smart, subversive, and unapologetic, it asks: how does language change us? How far have we come, really, and where are we going next? “Better Metaphors” is a collaborative process between playwright Kristin Idaszak and choreographer/dancer Erin Tracy. Erin Tracy is a director and choreographer whose original dance theatre work has been shown in New York City, San Diego, and Tampa Bay. She has performed at venues in New York such as PS 122, The Ontological Theatre at St. Marks Church, BAX, Galapagos and Dixon Place. 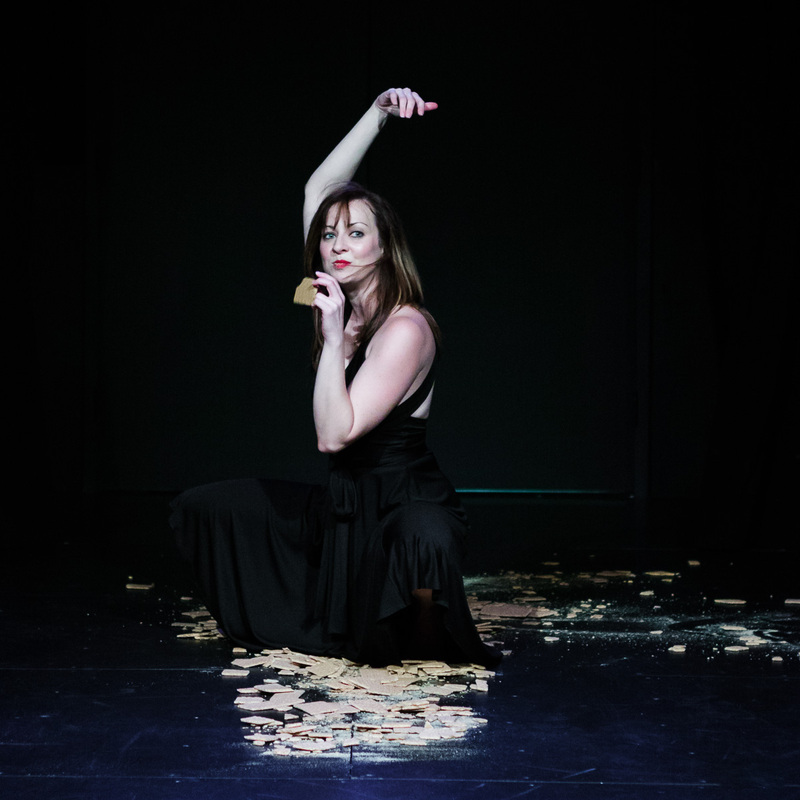 Previously, Erin was the Artistic Director of Spec Performance, a dance theatre company in Tampa Bay with a performance series dedicated to the development of new work. She was the recipient of a 2013 Individual Artist Grant from Hillsborough County for her evening-length work Verbo. She also created Foreign / Familiar Cities, a dance film and live performance hybrid as part of GenYes!, an arts incubator program subsidized by the Doris Duke Charitable Foundation. She choreographed, directed, and performed in The Third Thing, a collaborative process piece shown at UCSD. Recently, Ms. Tracy premiered the original collaborative work “Commence” as part of Salon Dances No. 6 at the Encinitas Library. Her undergraduate degree is from the Experimental Theatre Wing at NYU. She is currently pursuing her MFA in Dance Theatre at UCSD. “Better Metaphors.” Dancer: Erin Tracy. Photo: Jim Carmody. PATRICIA RINCON, PRDC’s Artistic Director, has performed, directed, choreographed and participated in annual workshops and performances in Mexico, Argentina, Europe and California. 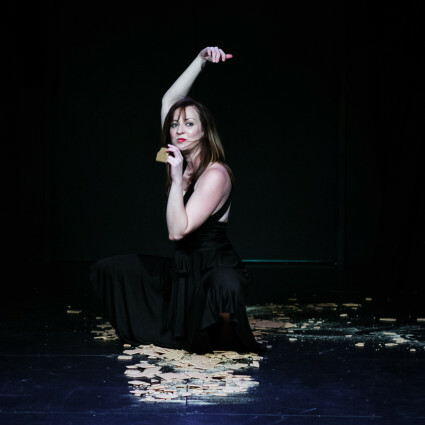 As Artistic Director of Patricia Rincon Dance Collective she has continued developing the popular annual Blurred Borders Dance Festival and the Myth Project dance theatre series, set in San Diego each year. The company completed a performance tour to Buenos Aires, Argentina in 2012 and recently completed a tour to the international TANZINOLTEN Dance Festival in Switzerland, as well as other performances in Zurich, Switzerland in 2013. Since 1999 Ms. Rincon has been an active trans-border visiting artist at the El Centro Cultural Ignacio Ramírez El Nigromante (Bellas Artes) in San Miguel de Allende, Mexico. She has been actively teaching workshops to the community and developing both local and international performances with her professional dance company: the Patricia Rincon Dance Collective. Ms. Rincon also continues to develop dance video-film projects that have been awarded numerous UCSD research grants for research, development and publication of LATINO NOW: Landscape Of Desire, a documentary dance film by Patricia Rincon and Paula Zacharias in Spanish and English, about the American Dream and immigration ­filmed in Mexico, Argentina and California, and which had its premiere screening at the UCSD Art Gallery’s Fronteras Series, “Re-Remembering Fronteras,” in March 2011. With a rescreening at San Diego Repertory Theatre’s Tortilla Curtain, in March 2012, and at the National University Institute of Arts (IUNA) Buenos Aires, Argentina, September 2011. Ms. Rincon’s video-film Waiting, a dance film by Patricia Rincon and Paula Zacharias, had its international premiere at the Festival Internacional VideoDanzaBA, in Buenos Aires, in October 2008. Rescreenings included Tijuana-San Diego Dance-on-Film Festival, at Tijuana Cultural Center (CECUT), February 2009; and at the La Paloma Theatre in Encinitas on March 2009. Ms. Rincon continues her research for her Myth Projects Series in Mexico, where in 2013 she received a UC research grant to return to San Miguel de Allende, Mexico. There she began to research the Chichimec and Huichol Indian tribes in the Guanajuato region to film and study these tribes and their cultures of weaving and sewing for work on a new dance theatre work. In addition Ms. Rincon is invited to annual artist-in-residencies at the Universities of Heidelberg, Frankfurt, Mannheim, and in Konstanz, Germany. She also taught for many years at the Universities of Zurich, Bern and Lugano Switzerland, and at the IUNA Instituto Universitario Nacional de Arte in Buenos Aries, Argentina. Ms. Rincon is currently Head of Dance at the UCSD Department of Theatre and Dance. She is former Chair of the Encinitas Arts Commission, where she also helped write the charter. The Patricia Rincon Dance Collective is a San Diego-based professional dance theatre performing company aspiring to educate dancers and enrich San Diego audiences by providing diversified, socially-conscious, innovative programming and choreography. The organization (PRDC) has been producing dance for 32 years, working both independently and collaboratively with other prolific artists and arts organizations since 1982: This year marks the 32-year anniversary for this artistic director/producer. More company information and additional background information on Blurred Borders Dance Festival #16 can be found at RinconDance.org.